A) This box cycles through your promotions (including special offers, discount codes and competitions) , helping you to draw in visitors that come to read your reviews. 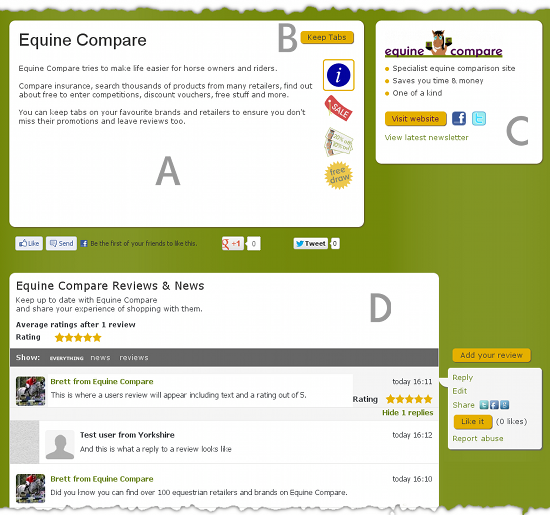 B) Visitors can choose to "keep tabs" on your page to be informed of your promotions whenever they visit Equine Compare. If they get our newsletter, they will also see a dedicated section for your promotions in their emails too. C) The info panel shows your logo, your unique selling points and has links to your website and social channels. D) The "Reviews & News" wall is where you interact with your customers. We drive traffic to your page from various places in Equine Compare, and best of all, there is no charge for creating and operating your page.